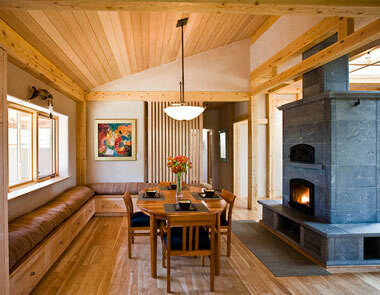 Timber framing is an age-old structural system utilizing braced-framed post and beam construction. 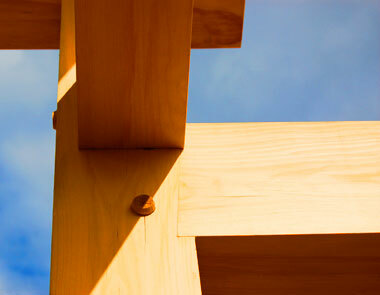 Mortise and tenon wooden joinery is hand crafted yielding a durable, ecological structure of practical beauty. Because the timber frame structure is completely surrounded by the clay and fiber enclosure the frame has timeless protection from the elements. This is the ultimate in sustainable use of timber because, as proven by historical precedent, the structures can be deconstructed and then re-used over the centuries. 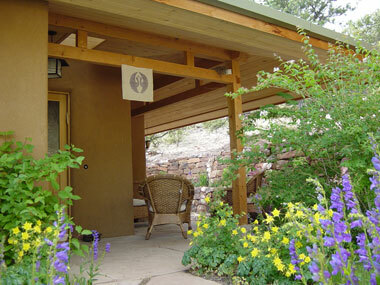 The 12″ thick walls combine clay soils with locally abundant fibers of straw, wood chip or hemp. This combination of thermal mass (the clay soil) and thermal insulation (the fiber) is called “dynamic insulation” because in combination these qualities create very comfortable interior climate and a high level of energy efficiency. This thermal mass/insulation combination is especially effective in conjunction with natural passive climate controls which are incorporated into the EcoNest designs. Natural cottons, wools and linens feel good when we wear them because they breathe. In contrast synthetic materials tend to trap moisture and odor on our skin surface creating a clammy feel. Similarly conventional stucco finishes are now synthetic or cement based with little vapor permeability Traditional clay or lime natural plasters, act like natural clothing for the clay/fiber walls creating a beautiful protective finish that allows the free flow of vapor through the wall. On the EcoNest exterior we use lime plasters where climatic conditions are more demanding and clay plasters wherever conditions allow. Interiors are finished with clay plasters. For the final color natural pigments are mixed into white clay and sand. The result is sensuous walls alive with the colors of nature and in resonance with the owner’s palette. As our European predecessors have proven, natural building materials can last for centuries provided they are protected from the elements. A good roof overhang or “hat” will protect the building from driving rains and standing snow. Our EcoNests typically have a three to five foot overhang and additional portals and pent roofs to protect lower elements under gable roofs. Similarly, natural materials need to be protected from the ground up. A stone base provides this “pair of boots”. The EcoNests utilize several natural climate control design features to help reduce the need for mechanical heating and cooling. 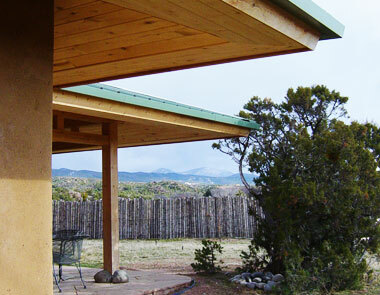 Shading roof overhangs, cross ventilation in each room, earth coupled flooring and massive adobe internal walls help keep the homes comfortably cool in the summer. 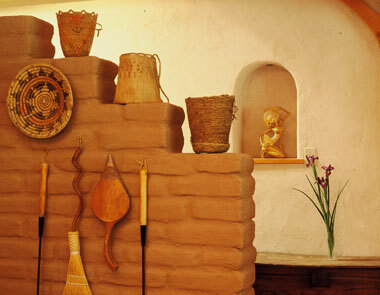 Technically the clay/straw walls themselves provide an R-24 insulation value. We have experienced them to perform at a much higher rate than a frame wall of the same R value would. This is due to the uninterrupted monolithic wall plane and the mass provided by the clay, which helps store heat. Nature has provided us with an infinite palette of colors and textures in the form of finish materials. Each EcoNest shell is an opportunity for the owners to create a personal expression. The role of our design team is to nurture you in this process by providing examples, ideas and resources. An EcoNest is designed to work in harmony with its natural surroundings. Mindful siting, reverence for what is present in the nature of the site, roof water collection, alternatives for gray water and human waste, recycling, composting and power from the sun … these are considerations that reach well beyond your building envelope that we will help you explore during the design phase and turn into a reality during your construction and beyond. Our vision is one of creating an ecological landscape for the cohabitation of humans in nature. We envision building a green community with each EcoNest as a building block and where, grouped together they create a synergy that offers a viable alternative to the ecologically destructive patterns of human settlement that are prevalent today. These are the design components that combined with the EcoNest® Building System, create your EcoNest. environments that are deeply nurturing to our health and well-being. Nature is the gold standard! First do no harm – All materials from foundation to rooftop are specified after careful scrutiny of their chemical content and their manufacturing and transportation impacts. 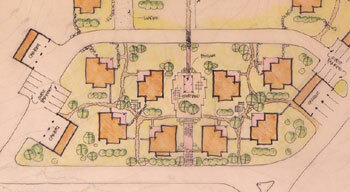 Each home is built according to the specifications as formulated in Paula’s book “Prescriptions for a Healthy House”. EMF safety – The home is wired for Electro-magnetic radiation reduction with special attention to bedrooms. 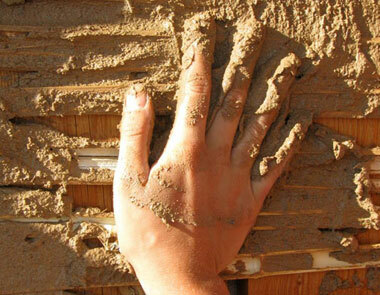 Tapping in to nature’s gifts – Natural humidity control and negative ion-rich indoor climate are part of the “natural advantage” gleaned from the many tons of clay in the walls. Color in accordance with nature – Clay plastered walls with natural pigmentation introduce the visual liveliness and complexity of nature into the homes while avoiding the textural and color monotony of painted drywall. Bringing nature indoors, extending the home into nature – Designs provide ample and multi-directional day-lighting, cross-ventilation, outdoor living “rooms” and indoor green spaces purposefully connecting the residents to the surrounding natural environment. Healthy heating and cooling – Radiant heating and passive heating and cooling create healthy and comfortable indoor environment avoiding the noise, drafts, air stratification and dust associated with forced air heating and cooling. Deep ecology goes far beyond a notion of sustainability and leaving ‘enough’ resources for future generations. It addresses regeneration and creating more bounty for the future. The question we ask is how can we not only ‘do no harm’ but in the very act of building and inhabiting our homes, can we do good? 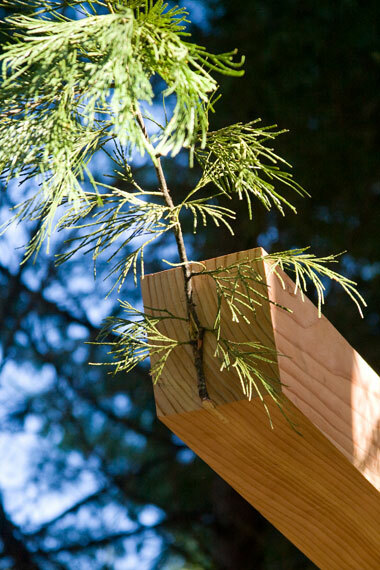 Local, local, local – Local natural materials are sustainably harvested, supporting the local economy and building local skills and involving the community in the building process. Built to last – The timber-frame and clay-based homes of Europe are famous for their durability having been continuously occupied for centuries. Mindful work – A healthy and conscious work environment results in a healthy and vibrant living environment. Dumpster-free construction – The natural materials avoid all of the packaging and waste that is generated in conventional construction and normally ends up in landfill.. Comfort without consumption – Natural climate controls create comfort and result in low energy consumption. Holistic teamwork – We help you to inter-face with other experts to integrate water harvesting, alternative waste treatment, integration between home and garden and solar technology. Do you have more questions about EcoNest and EcoNest homes? View our FAQ for a comprehensive list of questions and answers. Before an EcoNest can be built, it must be designed. Learn more about what makes an EcoNest so unique, durable and beautiful. EcoNest designs are models of beautiful simplicity. 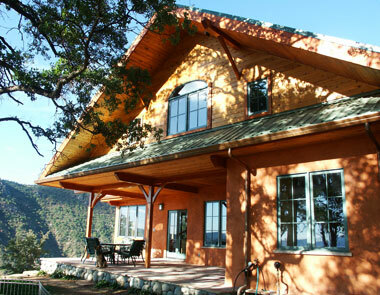 View our portfolio of natural, healthy homes. Are you ready to build an EcoNest? Here's how to get started.